Dos Rios, Texas, isnt about to win any awards as the garden spot of the nation. Its streets are a dangerous place to be any time of day. Its a city awash with corruption and drowning in its own poverty. But there is one man who wants to help. 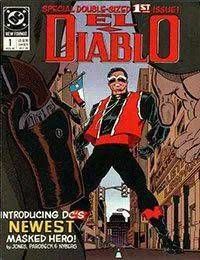 EL DIABLO. Hes Rafael Sandoval, and as a member of the Dos Rios City Council, hes tried to make a difference, to get the government working for the people. But further steps must be taken, and since desperate times call for desperate measures, the first of those steps is donning the costume of El Diablo, the masked avenger of the citys weak and threatened populace.